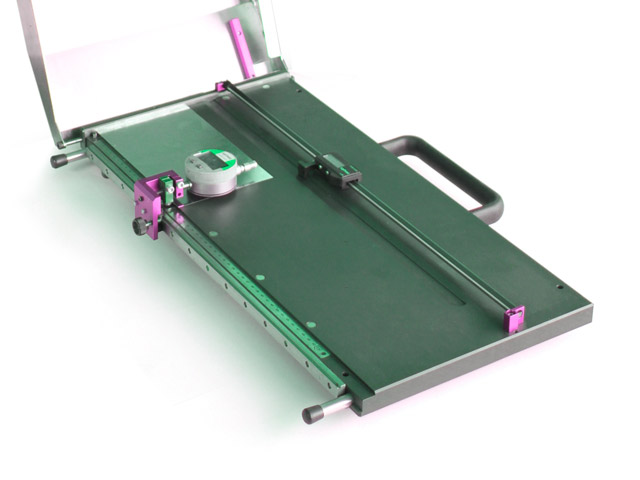 Blank measuring table with excellent accuracy and digital/analog indication for canbody diameters up to 158 mm, 190 mm or even up to 310 mm or sheets up to a length of 1000 mm. Blank length, width and squareness can be controlled very precisely and time consuming jams in the canbody production due to unprecisely cut blanks can be prevented. Battery powered and portable system are available. The biggest execution can be supplied on a supporting stand on request.